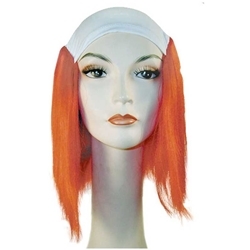 Includes one bald straight clown wig available in a wide range of both natural and bright colors. Wig features a professional quality cloth stretch front that can have makeup applied to it for blending with your natural skin tone. The bald straight clown wig is a popular style wig for clowning. Rather than having curly sides many traditional clown wigs have, this wig has straight hair.